CPL Calvin P. Titus (Photo on file at the U.S. Library of Congress). As the only chaplain assistant to be awarded the Medal of Honor, Calvin Pearl Titus is often cited as a model of bravery and selflessness. Yet, his award for daring gallantry — during combat in China when he was a corporal — actually came at the start of a long Army career of assisting chaplains in ministry, whether as an official chaplain assistant or not. Titus learned to play various instruments as a part of his uncle’s traveling church band. During one church meeting in Vermont in 1898, Titus learned of the sinking of the battleship USS Maine, which prompted him to join the 1st Vermont Volunteer Infantry as a musician during the Spanish-American War. His unit, however, never deployed before the war ended.Titus was born Sept. 22, 1879, to Calvin and Cora Smith Titus in the eastern Iowa hamlet of Vinton, but moved to Oklahoma at age 11 after his parents died. There, he lived with his aunt and uncle, both evangelists with the Salvation Army and later with the Pilgrim Holiness movement. In 1899, the Society of Righteous and Harmonious Fists, known as the “Boxers,” began attacking foreign missions in China, killing hundreds of missionaries and thousands of Chinese Christians. 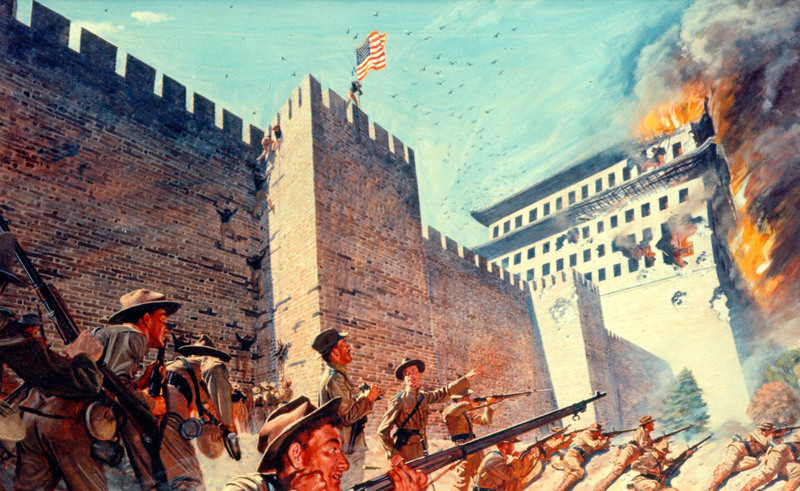 Their rebellion eventually made its way to the capital, Peking (modern day Beijing), where the group focused its efforts on destroying the part of the city housing foreign embassies and legations. A coalition force of nearly 50,000 Soldiers from eight countries was sent to rescue the city and to help quash the insurrection. Titus scaling the wall (Copy of print at history.army.mil). After reaching the top unharmed, the rest of his company followed, hauling up their rifles and ammunition belts by a rope made of rifle slings. Soon after, the American colors were hoisted atop the wall, inspiring the allied Soldiers to complete their assault, overtake the gate and enter the city. 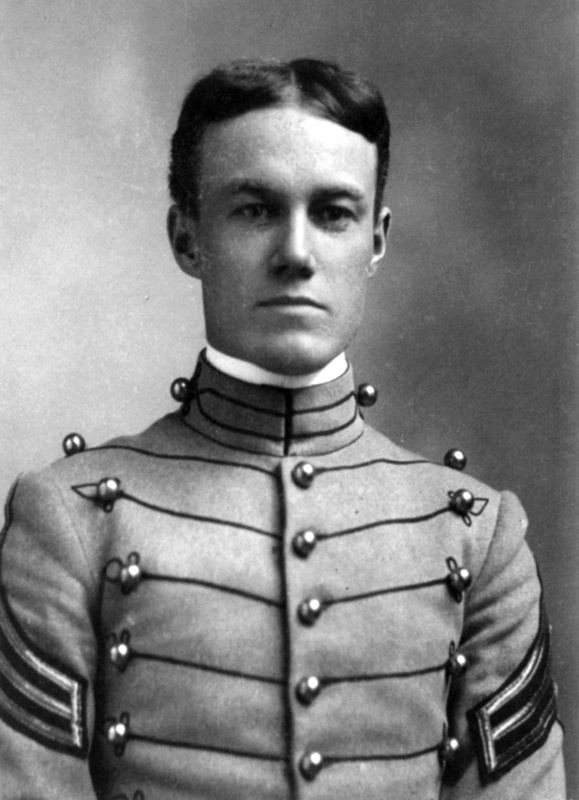 Upon graduating in 1905, Titus returned to the 14th Infantry in the Philippines as a second lieutenant. He later followed in his mentor’s footsteps, becoming an ordained minister in 1909. His desire to become an Army chaplain was thwarted, however, as his denomination was not yet recognized by the Army. Instead, he made the decision to, as an officer, change his career field to chaplain assistant in order to continue in ministry to Soldiers; the occupational specialty was officially introduced the year he was ordained. Nearly six decades after Titus’ decision, his church would merge to form the Wesleyan Church in 1968, now among the more than 200 denominations recognized in the U.S. armed forces. Groves’ son, Leslie R. Groves Jr., would go on to lead the Manhattan Project as a lieutenant general. Titus himself spent 32 years in the Army, including fighting forest fires in Montana, chasing Pancho Villa through northern Mexico, rebuilding France after World War I and teaching Reserve Officer Training Corps cadets at Coe College in Cedar Rapids, Iowa, just miles from his hometown. He retired in 1930 as a lieutenant colonel and died at the Veterans Hospital in San Fernando, Calif., on May 27, 1966, at the age of 86. He is buried at Forest Lawn Memorial Park in the Hollywood Hills section of Los Angeles. Titus’ famous reply — “I will try, sir!” — became the rallying cry of the 14th Infantry Regiment, and the official motto of the 5th Infantry Regiment. Also in his honor, the Military Sealift Command named a container ship, the MV Ltc. Calvin P. Titus, which is used to carry sustainment cargo to U.S. military units around the globe. The ship is based in Saipan in the Northern Mariana Islands, the closest major port in the United States to where its namesake earned the Medal of Honor a century earlier. Originally posted on the NCO Journal Website, an official U.S. Army, U.S. Government website. According to Title 17, U.S. Code, § 105, “copyright protection … is not available for any work of the United States Government,” so is legally re-posted here for educational purposes.